There are only a few guys in this industry that produce quality products. Card-Shark.de is one of them! I love this stuff!!! 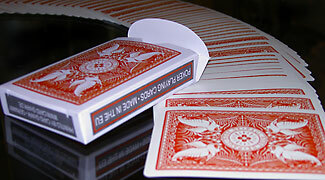 Your own designed deck or a single playing card in a large quantity. How much will my special playing card cost? You will be charged in Euro or US$, depending on where you live (inside or outside Europe). For your convenience, Paypal will convert the amount to the exact currency you use. The prices shown below are calculated using the current conversion rate from Euro (€) to US Dollar (US$) which is 1.4587 (09/11/2009). What kind of quality do the playing cards have that you produce? 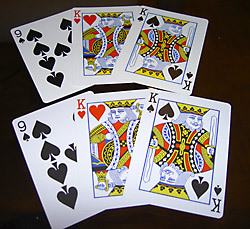 The cards are printed in Haicicle quality in a German playing card company. 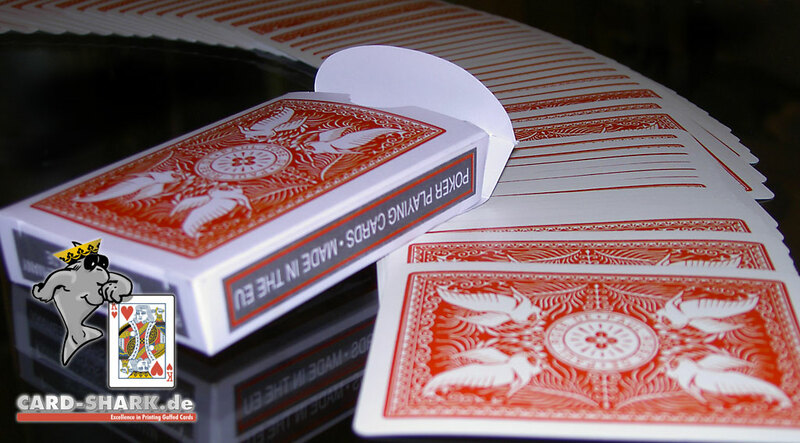 The cards meet the needs of magicians worldwide: they have the linen-structure, thickness, flexibility, the exact poker size and corner rounding comparable with Bicycle® playing cards. You can therefore hide these special cards within your Bicycle deck. Magicians will know of the various possibilities gaffed cards afford, so I don’t have to go into that. One thing, however, needs to be mentioned: my cards do not have the well known air-cushion finish that Bicycle playing cards have. This is due to environmental restrictions that we have in Europe, which prohibit the manufacturer to use nitro-finish to seal the cards (it is a water based finish, btw). The finish, however, looks like the Bicycle finish, so if you don’t necessarily want to perform flourishes, you will not notice a difference. I will not give up trying to find a perfect solution someday; but as I said, you will hardly notice the difference. But I do not like to get the same card 400 times, I am looking for a custom poker deck. Or I cannot wait until your next production run at the playing card company. The second drawback (if to say so): you will get the same card 400 times as these cards are printed in offset at the german playing card company. What if you only want one single custom deck for your next gig at a customer´s tradeshow? Well, I finally found the solution!!! Different compared to printing on Bicycle playing cards I can directly print onto the surface of my Haicicle playing cards. So I do not have to remove the finish on every single card and to reapply it after printing on the cards. That is why I can offer a complete custom printed playing card deck for an unbelievable price! I produced complete poker decks with blank backs at my germany playing card company. The blank backs will get your custom prints on my color laser printer. It is important to know for the magician that the cards will fit neatly into a genuine Bicycle deck as the faces are the same. Surely the ace of spades and the jokers look different as these card designs are copyrighted by USPCC. But see with your own eyes how similar the cards look. Just click on the image to see a larger version, at the bottom are Haicicle cards, at the top you see the appropriate Bicycle cards. If you can´t spot the differences, how could your spectators do? What back designs and colous are possible? Mainly everything you can imagine can be printed. What you can print back home with your color printer can be printed onto the cards. The printing area is 55 x 79 mm in size. You can send me your own back design if you like or you can choose of several custom backs and just tell me the information that should be added to it. Or I even can design your own back for you. Just visit my online shop and order your custom printed poker deck. The printed quality is top notch and will hardly be noticed as a custom print from a laser printer. It will seem that these cards have left the playing card company in large quantities! What are the costs for a single custom playing card deck and what exactlly can I expect? You will get a whole poker deck with 52 cards. On top you will get two Jokers, where you can choose out of three different versions. You will get these cards in a custom made card case that also is printed with your own back design. The price for this custom printed deck is only 25 Euro per deck (for European customers incl. 19 % VAT, for customers outside of Europe the price per deck is 35 US$)! There is also a one time fee for arranging and designing your deck of 20 Euro (28 US$ for non EU-customers) or a reprint fee of only 10 Euro (14 US$ for non EU-customers). Would you like to extend your custom printed deck with additional possibilities? Nothing easier than that, you will find some standard gaffed cards in my online shop that you can add to your deck order for only 2 Euro per card (2.8 US$ for non EU-customers). So how about a Skinner Monte or a B`Wave effect using your own style playing cards? Everything you ever wanted, isn´t it? Oh, not really? You still want more as your wish is so individual that it cannot be realised with my standard cards? Just contact me, I am well-known for individual card productions. How can I order? What kind of data do you need? Each printing job is unique. You might already have an exact idea of your card or even the necessary printing data. Perhaps you want me to design your card? As my experience shows, it is best to discuss every job individually. Often the devil is in the details. Just contact me and we talk it over. But for the most cases you can just visit my online shop where you can arrange your deck that you would like to get.